On a typically quiet and otherwise inauspicious Thursday morning, Christine and I were finally able to welcome our very first app into the world. Weighing in at just 0.7 MB and designed to work on any modern iPod or iPhone, the F1Minute App is a joy to behold. 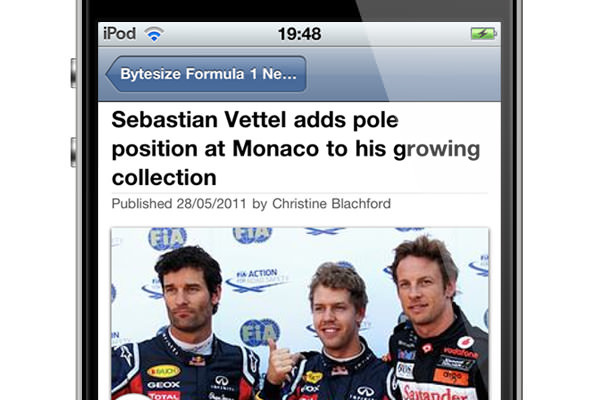 If you're a Formula 1 fan with an iPhone or an iPod Touch, visit the iTunes App Store now to download the F1Minute App now. Whilst the new App largely speaks for itself, there are likely to be a number of questions surrounding its release. If you have any thoughts or feedback please do let us know in the comments below, in the meantime we'll try and anticipate a few with a brief FAQ. In the few short hours since its debut, we've already fielded the "is there an Android version available" question and the simple answer to that "almost certainly". We have the technical capability, the software and the hardware to make it happen, the only unknown is how well an app might be received by the F1 community. If you don't have an iPhone, but you do have an Android device, please show your interest either in the comments below, on the F1Minute Facebook wall or via F1Minute on Twitter. Additionally, if you have friends who do have an iPhone, hassle them to download the app too, because the more interest we see, the more time we can justify dedicating to such things. We are almost certainly going to be releasing a version for the iPad as the step from small screen to medium sized screen is somewhat trivial. Headline management options - including "mark as read" and "remove"
The last thing to cover, is why we created something for F1Minute before Sidepodcast. There are a number of reasons, but notably F1Minute seemed to lend itself to the small screen more naturally. Even then, we had to rationalise features found on f1minute.com - for example moving F1 Big Picture to its own domain. By narrowing the focus of what F1Minute does, the functionality of the whole site can be "mobilised" without much compromise. The idea of migrating the vast feature set of sidepodcast.com onto a tiny screen was far to much to handle for our debut app, but that doesn't mean we're not open to trying in future. As a final note, I'll leave you with the insight that the design of individual f1minute.com pages are in reality three mobile phone screens lined up side-by-side. Conceptually the audio player, the story thumbnail and the sidebar could be stacked vertically inside a small screen and still function as intended. We redesigned first for the smallest screen and built out from there (even though the site redesign overtook mobile development along the way). The release of today's app marks the culmination of 9 months of rather intense work that started as last year's F1 season came to a close. One bundle of joy delivered successfully.